I had the good fortune to win a mini quilt from Katy of Katy Quilts. Katy is celebrating blogging for ten years. 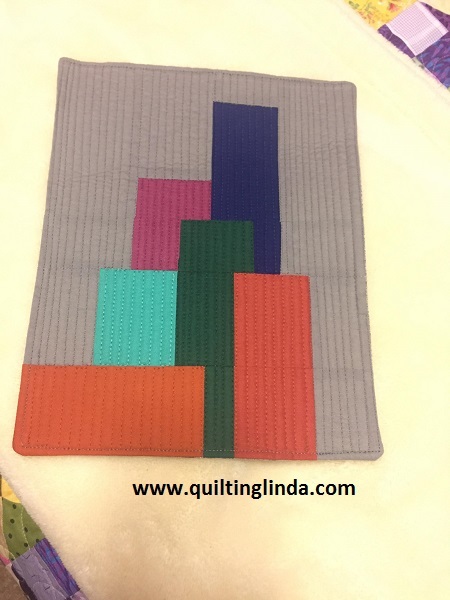 She chose ten small quilts to give away to readers of her blog. To win, we had to leave a comment. I was fortunate to win one of her mini quilts! I love Katy’s blog and read it every morning while I drink my coffee. She also has grandsons with the same names as my two oldest grandsons. Katy lives in Michigan and has a long arm quilting machine. I like to see the quilts she makes and the way she quilts them. It is inspirational to me. Thank you Katy! Congratulations on your 10 year blogiversary!